How to approach inaccuracies in Teju Cole’s Open City? 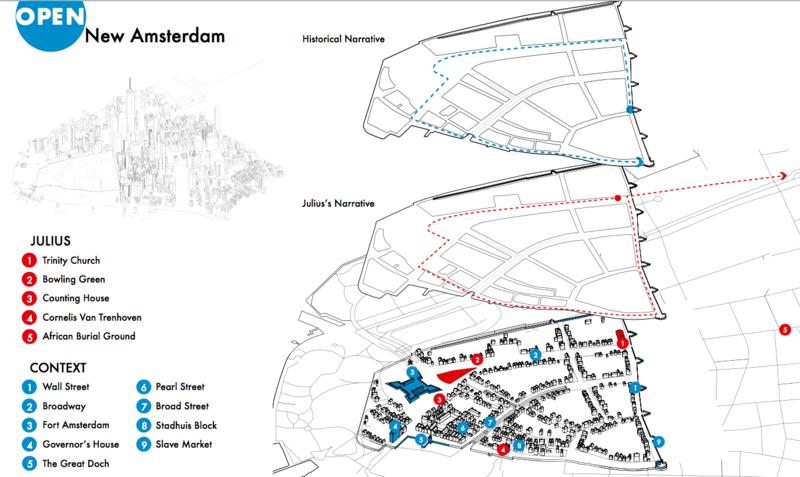 Last night, I was working on the New Amsterdam ‘layer’ of my palimpsests project. I was combing through the book, carefully drawing out quotes on New Amsterdam and placing them into the exon layer. 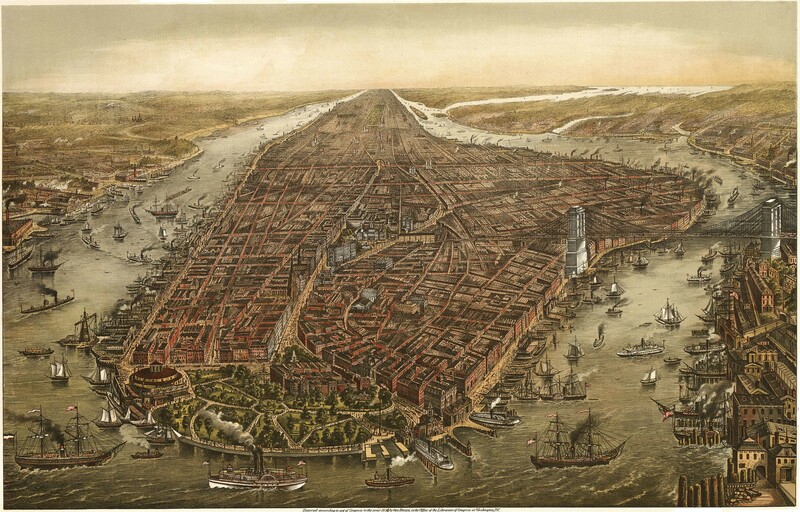 Starting on page twenty-five, Julius describes his patient, V., who is writing about Cornelis van Tienhoven, in a book called the Monster of New Amsterdam.Cole identifies van Teinhoven as the most influential schout, or secretary, in New Amsterdam. He was employed by the Dutch East India Trading Company. An important moment of time-travel in the text, I started doing research, hoping to find out more about this figure—perhaps where he lived, his family, where he was buried—to annotate into the exon. But as I searched, “Cornelis van Tienhoven AND East India Trading Company” nothing came up. Turns out, there was a big inaccuracy in Cole’s writing. The East India Trading Company functioned in East Asia. New Amsterdam was the hub of the West India Trading Company, a corporation founded nearly 21 years later than the former. Cornelius van Tienhoven was the schout of the West India Trading Company. How do we approach inaccuracy in Cole’s narrative? Julius’s descriptions of history provide a sense of connoisseurship, as if he is a historian. We take the worlds he reveals in Manhattan’s landscape as factual. When finding this inaccuracy, there is moment of disequilibrium. The carefully drawn skeleton of American history that we have inhabited with Julius is suddenly flimsy. It is as if I have caught him and by extension the author, in the act. Cole is not a historian, he is an author and this well of knowledge he draws from, is not as deep as it seems. But then I caution myself against this disillusionment. Julius, the character, is ruminating. Thinking and processing as he sees and hears other people’s’ stories. We are in his mind. Can one insist that an internal monologue be cited, accurate, researched? When I hear a story, or learn something about history, I make assumptions and build a narrative in order to place the new information into some sort of context, like slipping a piece into a larger, grander puzzle. But often, that information is faulty, based off of loose understandings I have with other information (often driven by inaccurate film and media representations of history). The Dutch East India Trading Company is more famous than the Dutch West India Trading Company. 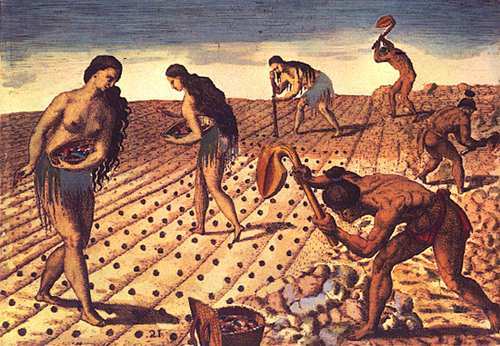 It was established in 1602 and considered the first transnational corporation. The Company dominated its rival for almost 200 years. Between 1602 and 1796 it sent nearly million Europeans to work in the Asia trade, using 4,785 ships, and “netted for their efforts more than 2.5 million tons of Asian trade goods.” With this in mind, I can understand how one would make an inaccurate but automatic association with the Dutch East India Trading Company instead of Dutch West India Trading Company. This understanding aside, I am faced with a quandary. The purpose of this project is the amplify, to expand the world of Open City in a visual way, for people to better immerse themselves in the palimpsests of Manhattan that Julius describes. When mapping this, do I map the story that Julius tells? Or do I correct the information? Do I map the ‘truth’. Would this—mapping the truth—move dangerously towards a different kind of project? That is, investigating the history of New Amsterdam? Cole, Teju. Open City: A Novel. New York: Random House Trade Paperbacks, 2012. 25-27. Print. “Dutch West India Company.” Wikimedia Foundation, 05 Apr. 2017. Web. 05 Apr. 2017. <https://en.wikipedia.org/wiki/Dutch_West_India_Company>. Amanda — An important discovery! 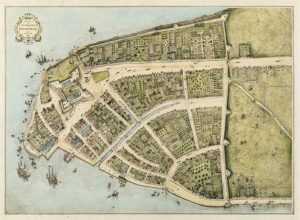 Your map of New Amsterdam can serve an annotative and corrective function (like the Genius site). I’m sure “East Indian Company” is an oversight on Teju Cole’s part — it’s not a fatal error, but probably a common one. And in the end it might say more about all of us than about Cole himself. Following our presentation, we are proceeding with mapping out the other layers of Open City. While we are finishing up New Amsterdam, we are moving on to the others. These are: Pre-historic layer of Native American tribes in Manhattan, the Civil War Draft Riots of 1863, and finally, the 9/11 layer. 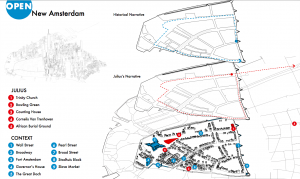 Example of a new iteration of New Amsterdam below. The mapping is coming along fine. And I am deriving great interest in developing the comparative paths : the historic trail vs Julius’s trail. But I am, as ever, concerned with my ability to “amplify” Teju Cole’s Open City. That is the true purpose of the project. I am concerned that this is not coming through. That I am slowly being distracted by gathering historic data and mapping cites. Below are some of the things I hope to execute towards achieving this amplification of the book. I hope that I can demonstrate the distinct bias (we all have bias’s) the leads him to choose these periods and sites. There seems to be a focus on violence, diaspora and the persecution of the ‘other’. Perhaps this will be evident when comparing the two paths: Through his path one will see his subjective view. And then the player will see the broader objective landscape that the historic path provides (let us kindly ignore that history is never objective). I hope to develop a serious digital image archive for each site and time period that is able to bring maps, manuscripts, photographs, newspaper clippings, videos, artworks, and other elements into one place. This way a player can access this wealth of information, see how much is really out there. The player can understand that Julius is articulating a small piece of a huge matrix of data. I hope to create a way to synthesize the sensory-visual perspective of Julius. Will this be by going to the street where he has his rumination, taking a picture of the street, and then superimposing an image of the historic period into a portion of the photo? Attached is an example of such a thing. 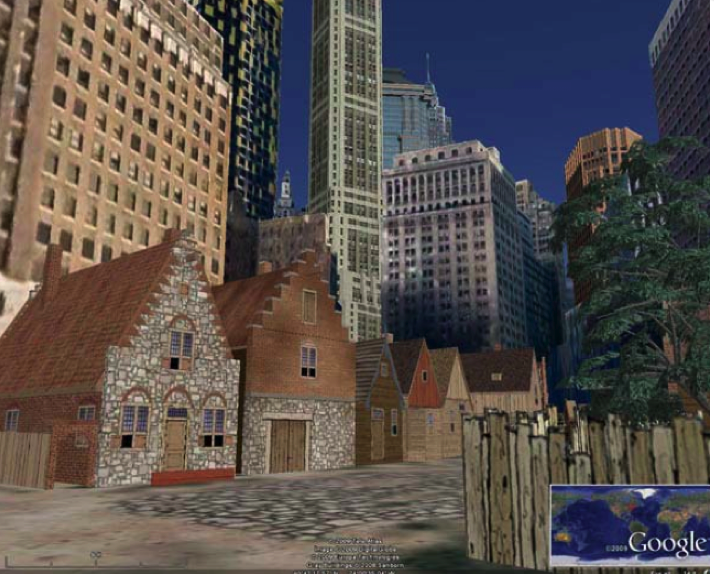 And artist rendered part of New Amsterdam into contemporary Manhattan. 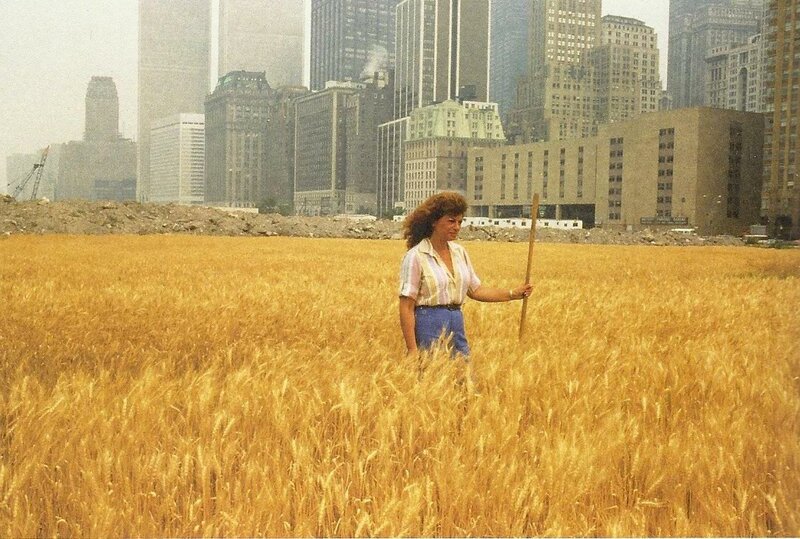 The site where Agnes Denes planted her field was set to be transformed into what is now Battery Park. It was a brief, ecological intervention made before the large-scale project was set to launch. 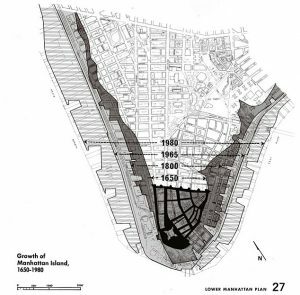 While the intention of her work was to remind the viewer of the environmental consequences of development, I wonder if Manhattan’s history entered into her process. 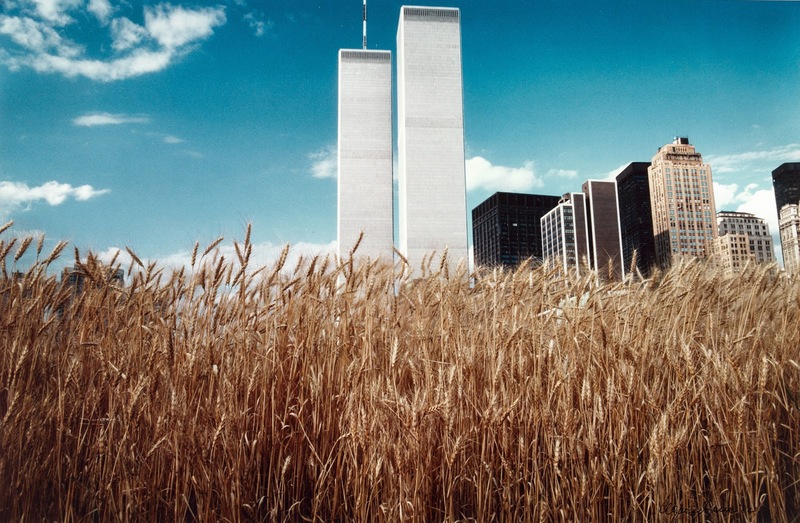 The visual juxtaposition of the abundant wheatfield with the Twin Towers as a backdrop creates anachronistic images: of Contemporary Manhattan, 2001 Manhattan and Manhatta prior to 1624. 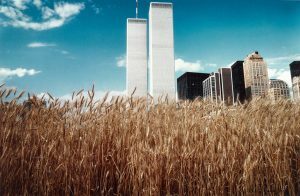 It draws up my memories of what is no more, such as the Twin Towers, and what Marianne Hirsch calls post-memories. These post-memories manifest in imagery of the native American presence in Manhattan, the village that used to occupy Kapsee Point, and the farming, fishing and hunting that took place near the area. There is a secondary element to the powerful mental-imagery I am associating with the location. 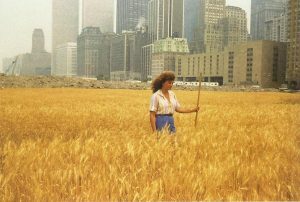 The area where she planted the wheatfield as well as the location of the towers, did not exist in 1600’s manhattan. The southern area was expanded outward using landfill at three times, 1800, 1865, and 1980. Thus, I am applying memories, to an empty space, that has a different series of different hard, historical moments: the three land-fill interventions. Whether intentional or not, her artwork articulates the many changes the southern tip of Manhattan has undergone. Crug, Don. “Art & Ecology:.” Art & Ecology: Ecological Art Perspectives and Issues: Ecological Restoration: Agnes Denes. Green Museum, n.d. Web. 26 Apr. 2017. <http://greenmuseum.org/c/aen/Issues/denes.php>. 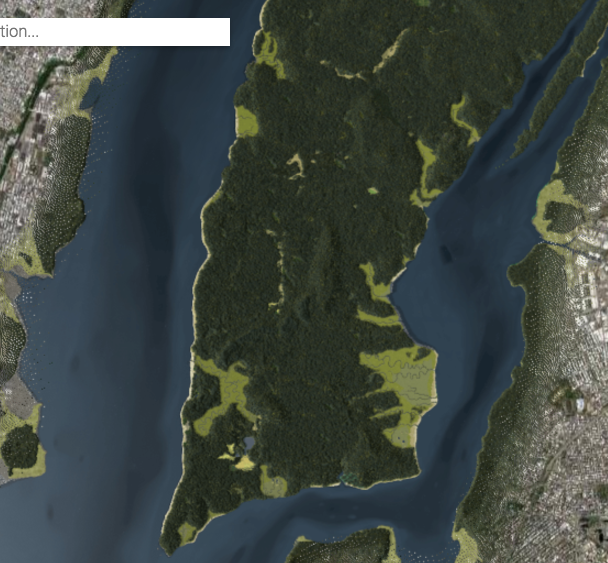 In my original proposal I suggested using two kinds of software: WalkJogRun for mapping in contemporary Manhattan and VisualEyes for creating historical maps. The latter platform was beneficial because it was interactive. We planned to upload period, archival maps of each timeframe into the platform to serve as the ‘ground’ of each layer. Then we were going to annotate the maps with key historical moments, attaching links to sound and archival materials. It seemed simple. We started looking for historical maps, one for each era of our Palimpsest game. Then we discovered a problem: the maps available to us were limited. Over the 500-odd years of time that the four periods we focus on cover, the way maps of each period were made differed from one another. Further, the information each contained varied in completeness and comprehensiveness. There was no map for 1863 that showed in detail the key locations where the riots took place (fig. 1). 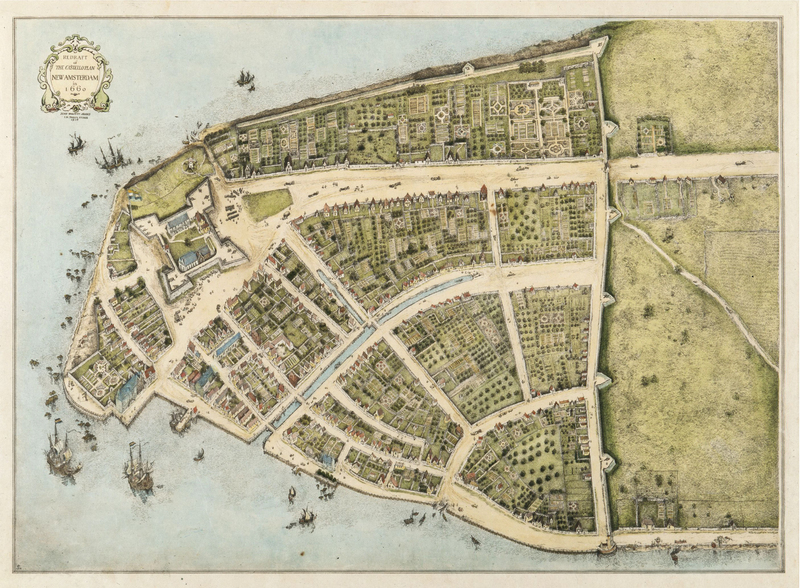 For New Amsterdam, the maps were illustrations. While they were interesting, they told little about the architecture and usage of the buildings and sites (fig. 2). 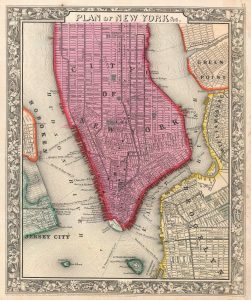 As for 1600 Manhattan (or, as it was known, Mannahatta) there were no maps at all. 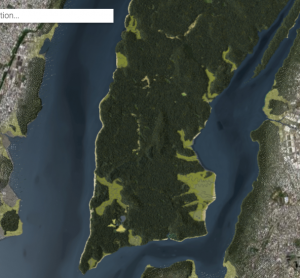 Some digital mock-ups of pre-colonial Manhattan gave us an understanding of its ecology (fig.4). A few fantastical colonial renditions of Native Americans and their settlements led to more confusion than an understanding (fig 5 and 6). We resolved to fall back on more common mapping platforms, Rhino and Adobe Illustrator, in order to build customized ones for each period. Little did we know how much time each layer would take to build: approximately a week per layer. This timeframe encompassed three stages: Research, Drafting, Annotating (both with text and illustration). In terms of the information we would include, we decided on a combination: elements from Teju Cole’s depictions, and historically accurate information drawn from research. We noticed early on that Julius’s perspective of the periods he referred to was rather parochial, meant to illustrate a point or perspective he had. The historical background surrounding his references was much more extensive. We wanted to illustrate the relative differences between the two. We researched maps, personal journals and newspaper clippings, illustrations, sketches and illuminations. 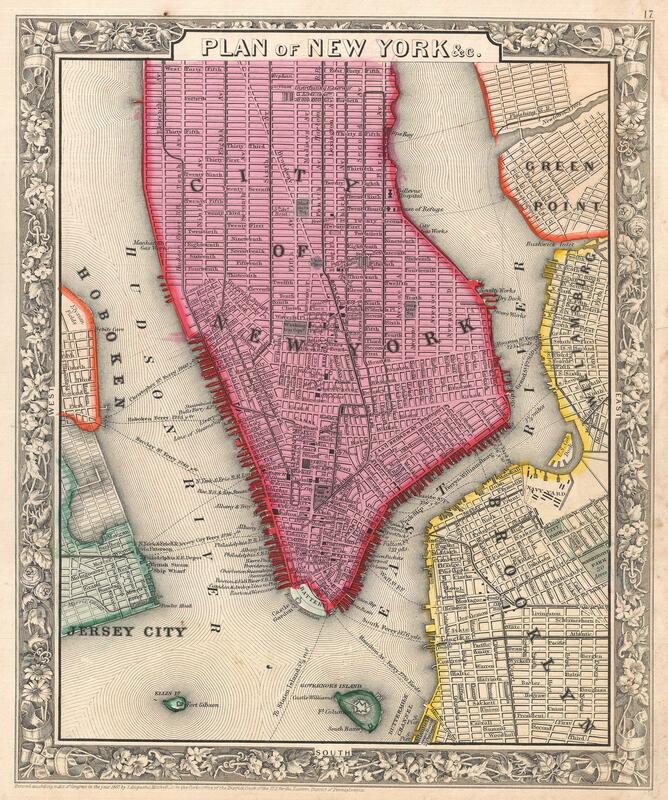 We referenced to books and articles on the history of Manhattan. We tried find out the parameters and scale of each space, how many buildings there were, the timeline of events taking place there, how people interacted with the space, if the locations still existed today and if they didn’t, what building replaced them. Drafting was tedious. Each line, each building, each plant had to be hand-drawn in. But it wasn’t enough to build the maps, we needed to figure a way to order them, and to highlight certain parts of them so the material we wanted to communicate to the viewer was immediately apparent (I’m still not sure we accomplished this). Some of these maps have been a success. New Amsterdam is easy to read, as is Civil War Draft Riots. However, Lenape Trail and 9/11 are proving to be a challenge for opposing reasons. Lenape Trail, set in 1600–twenty-odd years prior to Dutch occupation–suffers from a lack of information. 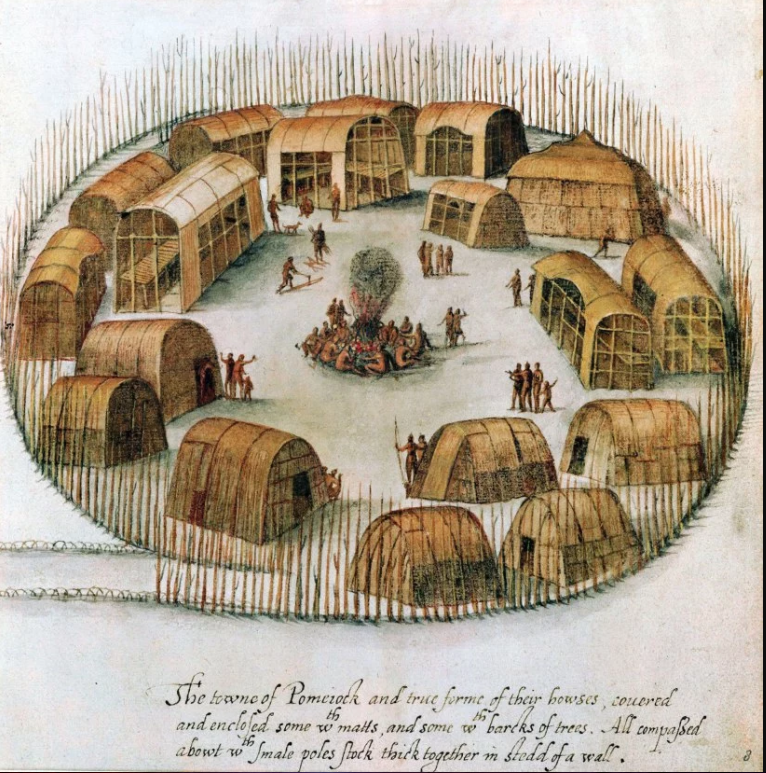 We know about 5 Native American settlements that were on the island, the general form of their dwellings, their agricultural and hunting practices. But there is little to no footprint of there presence that remains in Manhattan today, and with such broad information, we are largely building a world based off of a mixture of guessing and research. On the other hand, the 9/11 map suffers from a deluge of information, and sensitive information at that. Deciding what we want to articulate and curating the accompanying visual material is a challenge. How sensitive should I be to possible triggers that photos of the tragedy may have? Should I instead articulate the mechanics of how two buildings, damages and burring would collapse? Or, in line with Teju Cole’s reflections, express the loss of life? As we attempted to problem-solve how to represent this site and event, we realized that our relative perspectives gave us different reasons for concern. Since it was a dialogue, we thought we would record our conversation in real time. The link is below.